The American Geode team just returned from 4 days at the Tucson Gem and Mineral Show, and here are some tips, hints, and tricks to make your visit to the Tucson Gem and Mineral Show FUN, EFFICIENT, and FANTASTIC! This is Part 2 of a series about how to enjoy the Tucson Gem and Mineral Show, and related gem and mineral shows. 1. Nevada Smith’s Saloon is one hell of a dive bar. Cheap drinks, very varied crowd of locals, and great food! Nevada Smith’s Saloon is where American Geode watched the SuperBowl this year, and we stopped by there one other occasion. The BBQ chicken and brats we had there were excellent! The wings looked great, and they cook their steaks out on a grill in their patio. If you are an aficionado of dive bars, check out Nevada Smith’s Saloon. 2. The best bars we found at the the Tucson Gem and Mineral Show were the hotel lobby bars connected to some of the gem and mineral shows on the west side of I-10. 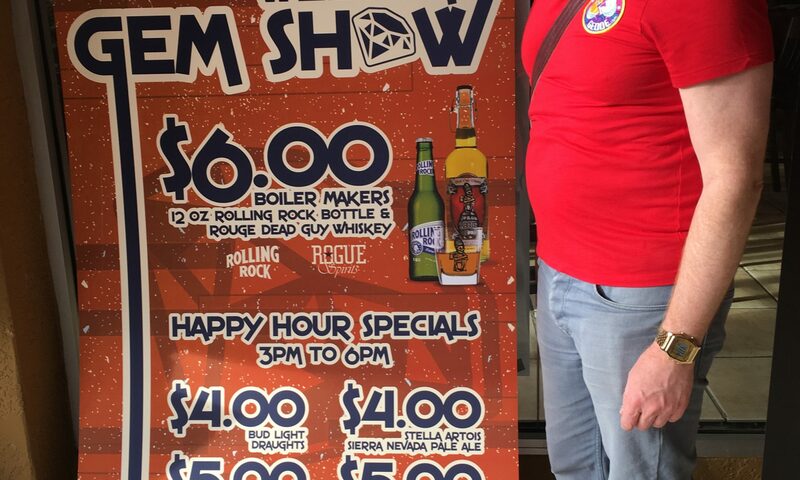 While the American Geode team were talking with dealers at the gem and minerals shows alongside the west side of I-10, we took breaks at their respective lobby bars. The bars had great drink specials, and the lobby bars were full of fellow rockhounds. We found it very easy to strike up a conversation, and met a famous jewelry designer, and some other fun folks. The Ramada Inn along west I-10 had a great bar, as well as the other hotels just north of the Howard Johnson, which is where we started. 3. We had a great bar meal and drinks, among a very good looking crowd, at Barrio Brewing Co. It is a little outside the location of the gem and mineral shows, but it is a local brewery with food striving to be locally sourced. The crowd was great looking, the staff were great looking and fun. They have a large cooler covered in stickers of various businesses and bands. We had an American Geode sticker on us, and they graciously added American Geode to their collection. 4. Downtown Tucson is full of bars and restaurants, and fun to walk up and down for a pub crawl. We did not find downtown closely connected to the Tucson gem and mineral shows, but they were full of a lively crowd, many college students, and a wide range of bars from ones with live music, to an arcade with a bar, or bar with an arcade, among other sports bars. The main strip of bars is along Congress and 6th Avenue. American Geode found downtown worth spending an evening if you are interested in taking a break from the rockhound, gem, and mineral crowd. That is all for this installment of “Tucson Gem and Mineral Show – Guide for First Time Visitors, Part 2 (Where to Drink and Eat).” Keep reading the other American Geode articles for more insight on the Tucson Gem and Mineral Show, and various Tucson Gem Shows. American Geode posted some laughable quips about our experience at the Tucson Gem and Mineral Show over Twitter. Got questions about Tucson Gem and Mineral Show? Contact American Geode through the “Contact Us” button on the American Geode homepage: http://www.americangeode.com.